“A long sleeve t-shirt, some khakis or jeans, and a loafer-type shoe like Sperry’s.” is what he thinks is in this season. Always remember the golden rule: Keep it simple and you can’t go wrong. I’m hoping that I help West High dress stylishly year round. Chao! With the holiday season upon us, this edition of Top Five features five sure-fire movies to spread a little holiday cheer. I could be biased because I grew up just minutes away from the Home Alone house in Winnetka, Illinois, but this movie is fantastic! Never has there ever been a little brat quite as brilliant as Kevin McAllister. That stupid face that Macaulay Culkin makes throughout the movie is an epic win. Though the Muppet/live action combo is a little weird, it’s something The Muppets does well. Narrated by “I am really, actually Charles Dickens” Gonzo and Rizzo the Rat, this Muppets movie is by far my favorite. It’s a Christmas musical with all your favorite Muppets. I’m pretty sure that equals a holiday masterpiece. Everyone’s seen this movie and loves it. Walk into the Christmas department of any store and half of the stuff there is Charlie Brown related. “Can’t you even tell a good tree from a poor tree?” Positively, absolutely Peanuts at its best. Starring Will Ferrel and Zoey Deschanel, Elf is an ingenious movie about a human raised as an elf and his quest to find his father in New York City. Will Ferrell is eccentric in a whimsical and loveable way. And besides, who can resist a movie with a puppet narwhal? Is there any such movie as iconic as this one? Taking place in northern Indiana, this personal narrative flick is based on the book In God We Trust, All Others Pay Cash, a collection of short stories inspired by Jean Shepherd’s youth. It’s hard to choose a favorite scene – the leg lamp, the triple dog dare, and the “oh fudge” moment are all tied for me. Perhaps it’s the fact that TBS shows it for 24 hours straight on Christmas, or the fact that when I was little, we always watched it Christmas Eve, on the good old VCR, but A Christmas Story will forever be the Christmas movie to me. If you haven’t heard of Twitter yet, then odds are you have been living under a rock. Social media has taken over the way we live our lives. In just 140 characters or less, people can express their innermost feelings with the entire world, and share their ideas. Tweets can range from @Westjessprobs to just the average student. While you’re at it, give me a follow @carterhahn5. One thing that all three of those people have in common is that they all have over 8 Million followers on Twitter. Just think about it. These people send out just one tweet, and it will be viewed by double the population of Kentucky (4,369,356). It’s crazy for me to think of having that many followers when all I have is a wimpy 419.
associates that tweet with any other tweet that has “hashtagged” the same thing that you did. If lots of people have “hashtagged” the same things, then it becomes trending. This is a very effective way of getting information out to the people. Because if you see lots of people that you follow tweeting about the same subjects, you will most likely want to learn what it is they’re tweeting about. All in all, twitter is a very effective tool for the spread of information, and I recommend getting one to all of you out there who are #twitterless. This month’s Colt Nation Athlete of the Month is Ross “Kitty” Gillispie. Ross is a freshman and played football for his first time this year at West Jessamine. Ross’ season was cut short when, early in the season, he suffered a broken arm in practice. After having surgery for his injury, Ross continued to show up to practice and support his team for the duration of the season. “I definitely feel like I was an encouragement for the team. Don’t quit what you love no matter what happens; even though I was out for the season I didn’t quit,” says Ross of his season ending injury. Ross plans to train and prepare for his upcoming football season in the winter and perhaps run track in the spring. My advice for underclassmen is: don’t do drugs! This is the first year for West Jessamine to add a 25-minute “Enrichment” period for three of the five school days. Enrichment aims to boost junior ACT scores by allowing both juniors and sophomores access to “Triumph College Admissions” (TCA), a proven standardized test preparation program. For the rest, the 25 minutes essentially serves as a study hall. 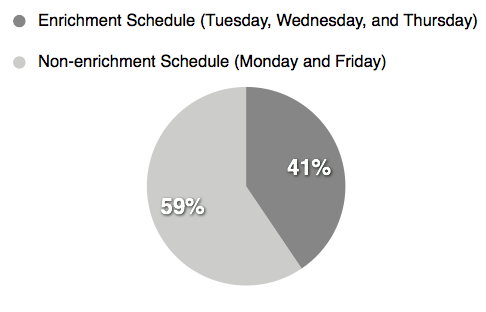 Come May, we will have spent about a full week’s worth of school time in enrichment, so the response is worth examining. Question 1: Do you find the 25-minute enrichment time helpful? Question 2: Do you prefer the schedule on enrichment days or non-enrichment days? Students’ main concern was the limited time in enrichment. 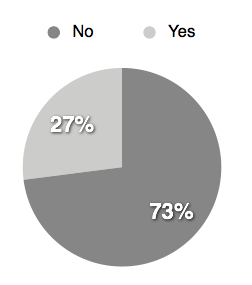 Even the full 25 minute period, assuming no technical delays, “does not offer sufficient time to accomplish its stated purpose”, as one respondent put it, adding that “a dedicated elective for those not meeting benchmarks would better serve students.” This suggestion is backed up by the fact that only 27% of respondents found the time useful, while 41% preferred the schedule on enrichment days with shorter class periods. An extra block would probably mean six one-hour classes, also giving students more opportunities for involvement with the arts. Students also complained about actual use of TCA in conjunction with the iPads/computers. “In many cases, passages and questions relating to them cannot be viewed simultaneously,” said junior Daniel Sherfey. Classmate Isaiah Estes added, “taking quizzes on TCA is clunky and often results in a lot of misclicks and angry students.” Thankfully, the iPads provide an adaptable platform which will easily allow for the program’s inevitable improvement. Administration has also been working hard to ensure more students are able to log into TCA and make the most of the program. Many juniors, despite complaints of the current system, liked the idea of a dedicated time to prepare for standardized testing. Sophomores felt differently, and it only makes sense. As one respondent put it, “Sophomores do not see the value of working on a test they will not take until the Spring semester of their Junior year.” Many of those who have found the time useful, in all grade levels, use it to catch up on homework and study… or play knock-out. Plenty of other complaints were made, summed up by one respondent who commented “enrichment is what happens when politicians decide they know how to improve education.” Unfortunately, this complaint, along with most of the others, is of a much different, deeper problem than what enrichment intends to solve. At the root of many problems is a public education system which fails to recognize that higher test scores do not guarantee a better-educated student. In the final movie of Christopher Nolan’s “Dark Knight Trilogy,” eight years after Bruce Wayne (Christian Bale) gave up the role of batman he must put on the suit one last time to fight Bane (Tom Hardy), a villain determined to show Gotham that the city has been corrupted by the police. In the end when it seemed like there was no hope for the city, Batman appeared for the last time, along with Anne Hathaway as Selina Kyle, AKA Catwoman, in order to save the city from his own creation. It was an appropriate ending to the trilogy. I give this movie 4 1/2 stars out of 5 stars. Students at West Jessamine High School have really been taking their musical interests to the next level. Four students have done the seemingly impossible. Not only have they been living “The West Way,” they have taken Mr. Jones’ illustrious example of how a model West Jessamine student is classified and turned it into words. And thus, the birth of “The West Way Pt. II” mix-tape. Carson Ball, Carter Hahn, Jake Purkins, and Will Henderson recorded their first song, The Office, and released it to be viewable by the public on November 19th. Since then, the video has had over 320 views, and was widely talked about on social media networks. The crew has since then published one other song and claims that many more are on the way. Dodging all of the criticism from what they call their “haters”, this group claims that they didn’t choose the rap game. Rather, the rap game chose them. Most of today’s enemies are made up. Everyone looks for an antagonist: the idiotic driver on the other side of the road, that demonic political party, or all of the authorities living just to ruin your life. Inevitably, many end up ignoring the real enemies. Friday’s shooting was another humbling demonstration of death’s looming threat, reminding us again that life is nothing to be taken for granted. As in Columbine, Virginia Tech, and the Aurora shooting this past summer, we grieve for the innocent lives taken for no understandable reason. We put aside all present dilemmas, personal struggles, and petty complaints as genuine sorrow takes over our emotions. Yet although these tragedies are very real to us, we can’t quantify their meaning, and it’s beyond difficult to express them in words. For every other matter in the world, we can use money, resources, or political power to demonstrate something’s value. Such measurements fail to express our heartache for situations like this. But as we mourn, we must remember that the joy in our lives is just as real as the sorrow in these deaths. Have a Merry Christmas, everyone. As this semester comes to an end, practice for the spring musical begins. This year’s spring musical will be the Jessica Slaton production of “Once Upon a Mattress,” a funky new view of the classic story of the Princess and the Pea. After auditions were held just a few weeks ago, we are all excited to see the cast of strong actors and actresses, as well as some new faces to the stage. The musical is currently scheduled to open on May 2, and we are all excited to see how it turns out. We hope that you will come out to see the musical when it opens.